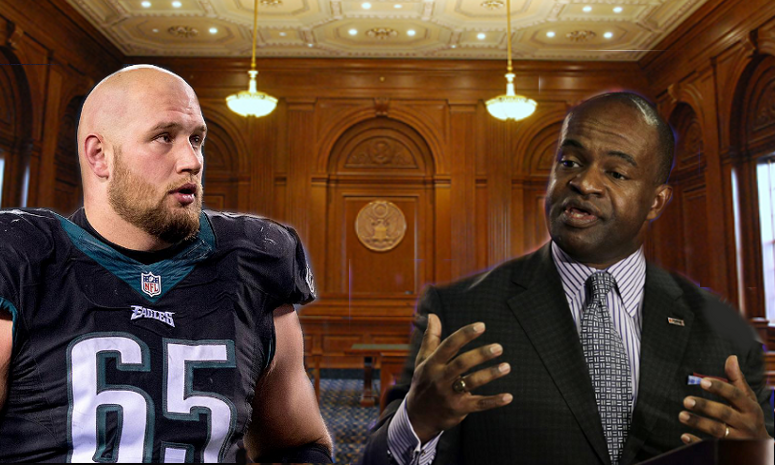 On Monday, NFLPA counsel responded to Philadelphia Eagles Lane Johnson’s opposition brief to their motion for summary judgment. Johnson has been engaged in a two-year plus legal battle against the NFLPA and NFL, that began with a suspicious drug test and went downhill from there. Johnson criticized the union for providing an inaccurate app to warn players of supplements that contain banned substances, and wanted to know why he hadn’t been removed from probable cause testing after two years had passed since he was placed in the program for a prior offense. Things continued to go south from there. The Union publicly criticized Johnson and, he alleges, made false public statements about him. He says that they initially agreed with his assessment that he should have been removed from probable cause testing until his arbitration began, at which time they reversed course, essentially blindsiding him. Throughout the process Johnson faced an uphill struggle in that the union unlawfully refused to provide him of a complete copy of the collective bargaining agreement (CBA) which he needed in order to make informed decisions regarding his discipline appeal. Johnson’s arbitration took place October 4, 2016. Though he hired private counsel, neither he nor his attorney, Stephen Zashin were provided the documents Johnson was entitled to under the Labor Management Reporting and Disclosure Act (LMRDA). Johnson’s case underscores the difficulty of getting an arbitration award overturned in federal court—especially when it’s a labor arbitration. Judge Richard Sullivan granted NFLPA’s motion to dismiss all causes of action aside from his LMRDA claims. Johnson, who has received no discovery throughout the two years his lawsuit made its way from Ohio to New York, insisted on discovery to finally find out why the union withheld the documents he needed for two years, but his motion for discovery was denied and the NFLPA was allowed to file a motion for summary judgment. Johnson’s attorney fired back in an explosive opposition brief, to which the NFLPA has now responded with a feat of “legal gymnastics” in which they rely on procedure and the barriers to obtaining discovery that it provides to shield them from addressing Johnson’s allegations. Here’s the first paragraph of NFLPA’s memorandum of law. The first cartwheel of the NFLPA’s floor exercise is the question of if NFLPA’s document production has mooted Johnson’s LMRDA claim. Since Johnson asserts that NFLPA still hasn’t produced the complete agreement, that should mean that his claim isn’t mooted. Summary judgment is inappropriate because there is still a question of material fact as clearly stated in FRCP 56. NFLPA states they’ve produced the documents to Johnson (albeit 2 years after his arbitration.) Johnson says they have not produced all the documents, and that those who state “they believe” NFLPA has produced everything are the very people Johnson accuses of retaliation. Is this not a dispute of material fact that only discovery could decide? Unfortunately for Johnson, Judge Sullivan faults him for not meeting the Twombly threshold. Decades ago the requirements for filing a suit were relatively easy to satisfy. All the plaintiff needed to do in his pleading was give notice of the lawsuit and its subject matter to the defendant. And the purpose of procedure was understood primarily to help get the case to the merits, which at that time meant to trial. Today in federal court, and in some state courts, the plaintiff must allege facts at the outset of his lawsuit to convince a judge that his claim is plausible. The rationale is that plaintiffs should not have access to court-ordered discovery of information from their opponent until they have demonstrated both a factual basis for their claim and that these facts describe the kind of event that a judge thinks might have happened…Requiring parties to state the facts that they know is fair, but this standard takes no account of how information is asymmetrically distributed: one party may have information that the other party needs for his claim (or defense) to succeed. In instituting new requirements for filing suits, the Court considered the cost of revealing information, but not the cost of hiding it. Unfortunately, Johnson can’t produce documents not in his possession, and the court’s refusal to grant discovery as to the existence of the documents, or in the case of oral agreements, written confirmation of those agreements, Johnson is left in the uncomfortable position of being unable to plead with the degree of particularity that it seems Judge Richard Sullivan demands. Since Judge Sullivan admits a violation, it’s troubling that he isn’t interested in learning why it occurred. The NFLPA follows its cartwheel with a back somersault, “Indeed, Johnson devotes most of his brief to trying to exhume and recast a retaliation claim that the Court previously dismissed and that, in any event, Johnson never pleaded under the LMRDA.” Zoom in on this image for a moment and put it in the photo album for later. The excerpts above are from Johnson’s amended complaint, dated February 14, 2017, and a joint letter to the court dated July 28, 2017. The amended complaint was filed in Ohio when the case was still under Judge Lioi’s jurisdiction, almost 2 years ago. I’m puzzled as to how the other parties in the case could be unaware of the existence of the claim. FRCP Rule 12(a)(1)(A) mandates that a defendant respond to a pleading within 21 days (although the time is often extended by order of the court.) Instead of responding with typical affirmative defenses that establish agreed and disputed facts, the NFL and NFLPA filed motions to dismiss, and in lieu of dismissal, transfer to the Southern District of New York. On July 6, 2017, Judge Lioi denied the motions to dismiss without prejudice and granted the motion to transfer. On July 20, 2017 NFLPA counsel Jeffrey Kessler filed a letter with the court stating that Judge Lioi “denied the NFLPA’s Motion to Dismiss without prejudice and ruled that ‘any unaddressed issues may be raised or renewed, if permitted by the transferee court.’” He also noted that this triggered a responsive pleading date of 14 days in accordance with FRCP 12(a)(4)(a), requesting an extension that was granted. The American Bar Association advises counsel, “If you file only a partial motion to dismiss, check the law in your jurisdiction to make sure you do not need to file a responsive pleading to those claims that are not the subject of your motion to dismiss.” While NFLPA (and NFL) sought to dismiss the entirety of Johnson’s lawsuit, they did not respond to Johnson’s LMRDA retaliation cause. 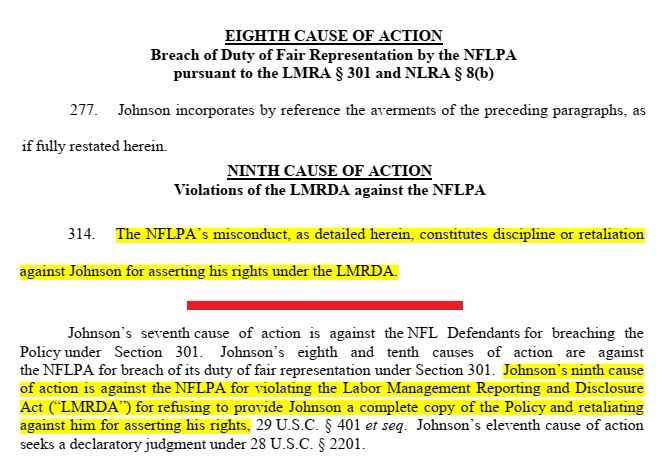 Had affirmative defenses been utilized the defendants would have responded to each paragraph of the complaint with, “admit, deny, or deny based on lack of information.” Had this taken place the NFLPA would have been forced to acknowledge Johnson’s LMRDA retaliation claim. Typically if a defendant does not respond to an allegation, it is considered an admission by way of omission. If you’re still with me, thank you. It took 17 paragraphs to critique the gymnastics of the first paragraph of the NFLPA pleading. Paragraph 1 brought a cartwheel and a back somersault. Paragraph 2 delivers a double salto with a full twist. This was mostly addressed in looking at grounds for summary judgment, above, but I’ll reiterate, how can there not be a genuine dispute of material fact? Furthermore, to survive a motion to dismiss, the complaint must state sufficient facts to state a claim that is plausible on its face. The court must accept the nonmoving party’s allegations as true. Johnson has identified at least four areas in which the NFLPA has deviated from posted policy and failed to provide supplemental documents. Since the court is in possession of all documents made available to Johnson, the absence of those he identifies as missing should qualify his claim as plausible. The court should also accept Johnson’s allegations as true since he is the non-moving party and has not had the benefit of discovery. The NFLPA has produced nothing aside from declarations from attorneys Johnson accuses of collaboration with the NFL, and seeks to depose, stating they “do not believe the documents exist.” Deviations occurred. Why is there no documentation? “Johnson also blithely accuses the NFLPA attorneys who attested to the completeness of the October 16 production of perjury, but such rank (and implausible) conjecture is not a valid basis to oppose summary judgment,” writes Kessler. Deviations occurred. Johnson attested to the incompleteness of what he received under penalty of perjury. Judge Sullivan’s failure to grant discovery has only demonstrated to the union that it may deviate from policy at will and withhold documents owed by virtue of LMRDA throughout the litigation and then claim that they are in compliance by releasing a few of the withheld documents just prior to a summary judgment push. Panthers’ Eric Reid, another union member is dealing with similar behavior from NFLPA. Reid wanted an investigation on the quantity of drug tests he’s been subjected to since his league return after what appeared to be a period of blackballing. NFL and NFLPA placed the investigation in the hands of “independent” investigator, Dr. John Lombardo, who has for all practical purposes called Reid a liar with endorsement of NFLPA. Lombardo is also at the heart of the controversy surrounding Johnson’s claims. Reid’s allegations haven’t passed the grievance stage yet. If NFLPA refuses to provide Reid with the documents pertinent to his grievance (and he alleges they haven’t) it seems he too, can head to federal court, and litigate for two years and still fail to possess the documents while enduring any potential retaliation the league or union wish to toss his way, just as with Johnson. In paragraph 3 NFLPA executes a triple salto to segue into Article III standing. 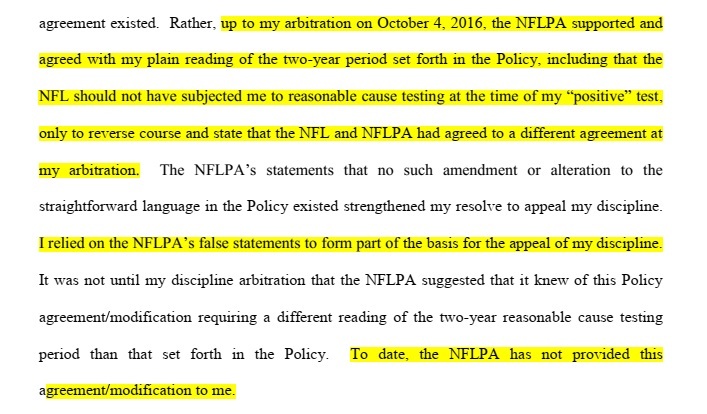 Before diving in, it should be noted that Johnson has never submitted a response “showing that he lacks Article III standing,” as the NFLPA phrases it, but rather demonstrating that he does not lack standing to assert his claims. It must be likely—not merely speculative—that the injury will be redressed by a favorable decision. He then cited binding Second Circuit precedent establishing standing for these claims that NFLPA asserts are either mooted by LMRA, or don’t exist, in conflict with what is stated in his complaint. The other claim, of course is the “nonexistent” retaliation claim in which, as I explained in detail in a previous article, is based on union retaliation and violation of Johnson’s right to speak freely without threat of punishment. The NFLPA conflates the LMRA claim that has been dismissed with the LMRDA claim that has not. The injuries are completely separate. The LMRA injury that NFLPA recognizes and finds “self-inflicted” is the suspension upheld in his arbitration, which cost Johnson games and income. Regardless of how one views that injury, and dismissal of his claims for that injury, the LMRDA claims are different. Johnson is entitled to have a jury determine the damages he may be awarded. In Richard Dent v. National Football League, the Ninth Circuit held that “parties to a CBA cannot bargain for what is illegal.” Perhaps NFLPA didn’t get the memo. Much of the brief is circular reinserting the points already elaborated on. One interesting notation is found as NFLPA flik-flaks to page 4. I can’t predict how Judge Sullivan would view this, but if I were sitting on the bench looking at this paragraph, I’d be inclined to impose sanctions or at least a strong bench slap. The NFLPA pirouettes and then bobbles a tad on this aerial when they try to convince the court that laboratory protocols aren’t part of the collective bargaining agreement. Doesn’t the policy state that protocols and chain of custody documents must be reviewed and approved annually? Doesn’t it also state that any deviations on the approved policies requires immediate notification of the parties? Doesn’t this say that the parties will endeavor to review and make modifications in furtherance of the Policy? That doesn’t sound like a very convincing argument for the relevant laboratory protocols as UCLA’s proprietary documents. The policy also goes into detail regarding how “B” samples will be handled among other protocols. If the above referenced sections have been superseded by delegation to UCLA, shouldn’t there be some documentation informing members of the union? Shouldn’t a vote on something of this magnitude have taken place? Sorry NFLPA, but I think we’re going to have to deduct a few points for teetering on that landing. The arbitrator issue is also far from settled. NFLPA appointed a third arbitrator on December 1, 2016. Johnson’s arbitration took place in October of that year. He wasn’t notified of the addition until October 2017, a full year after his arbitration. That’s the equivalent of a homeowner with an aggressive dog refusing to abide by city ordinances that prohibit dogs roaming at large until the dog has seriously injured someone, and then installing a fence stating, “It’s all good now. I’ve installed a fence.” How does an after-the-fact fence resolve the injuries already sustained or undo previous unlawful conduct? The NFLPA seems to have a game of “hot potato” going. NFLPA counsel tells the Ohio court that the parties decided by mutual consent to use only two arbitrators. NFL in-house counsel Kevin Manara says in a sworn declaration, “the bargaining parties agreed on their own to hire two arbitrators instead of three.” The NFL admits in its response to Johnson’s amended complaint that there was no written modification to agree to two arbitrators. That would indicate an oral agreement. But—NFLPA asserts that oral agreements are prohibited and NFLPA in-house counsel Heather McPhee says in her sworn declaration, she “does not believe” there were any oral agreements between NFL and NFLPA. If there’s no oral agreement and no written agreement, someone needs to explain how they came to decide. Telepathy? Either someone is lying or that’s about the only explanation left. It also sounds like a material dispute of facts that should defeat summary judgment. Really? NFLPA held out, why wouldn’t others when precedent sets no deterrent aside from union members’ money? As Kessler must surely know, the average union worker could not afford to maintain litigation this long, nor could he afford an attorney of Zashin’s caliber. As Professor Lahav states in her book, “most people who are injured do not sue.” Whenever one party holds significant advantage over the other and they wish to make an example of someone, how could this truly be seen as anything other than “encouragement” as Johnson says. 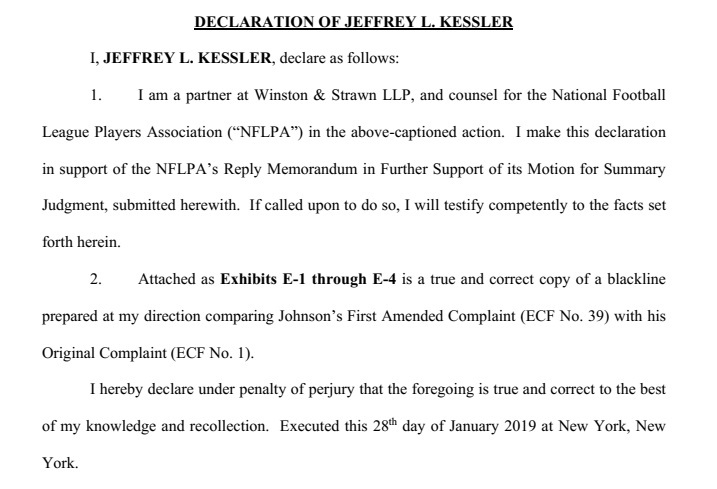 The NFLPA attempts to stick a landing with a very strange declaration from Jeffrey Kessler. He does not state why he has done this or what purpose it purports to serve in the declaration. In going back to the main brief, the exhibits are mentioned in a footnote. The NFLPA congratulates itself on finding the allegation they previously claimed Johnson never pled in both his original and amended complaints and subsequently haven’t addressed until now. Remember when I said to hang on to this statement which is in the very same document as the footnote? Apparently they are pointing this out since Zashin refers to “adding” the count in the amended complaint. That doesn’t mean it didn’t exist in the original which is no longer the operative complaint. So ends NFLPA’s less than impressive legal gymnastics routine. As for Judge Sullivan, the NFLPA claims he dismissed Johnson’s LMRDA claims outside §104 which both he and NFLPA claim would be mooted “when plaintiff receives a copy of the agreement in question.” Two-years after the arbitration. Think back to the dog owner. Would erecting a fence after two years after a person sustains significant injuries as a result of dog bites, followed by two years of violating laws that mandate restraining dogs from running at large be sufficient to satisfy a court that the person had been in compliance with the law all along? I somehow expect Sullivan to stick with the logic he presented as illogical as it may seem. So far, he has been unwilling to acknowledge Johnson’s remaining LMRDA claims, though they clearly exist. Zashin’s brief was powerful and compelling, but NFLPA’s gymnastics show could be enough, if he is more interested in closing the case than in uncovering union misconduct. The next move is his. Lahav, Alexandra, In Praise of Litigation, Oxford University Press, 2017, Kindle Edition, p. 123.